Thor: Ragnarok is still a little more than a year away, but as the production presses forward more and more details are revealing themselves. Fair warning for anyone who wants to go into the movie without knowing anything, this article may contain fairly significant spoilers for Thor: Ragnarok. With that being said, we now may know exactly how the Planet Hulk storyline is being used and how Karl Urban's Skurge, as well as Tessa Thompson's Valkyrie factor in to the movie. 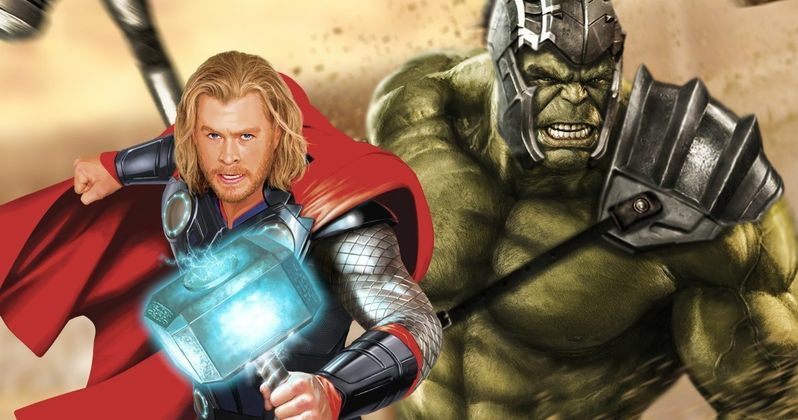 A new report from Schmoes Know claims to have some pretty significant plot details for Thor: Ragnarok, which help set up a lot of what we can expect to see in the movie. We have heard that the movie will be at least loosely adapting the beloved Planet Hulk storyline from the comics for quite some time, but if this report turns out to be true, it looks like it will be a very significant aspect of the movie. Here is what the report had to say. "While on Ragnarok, Thor and Hulk end up having to fight their way out in the arenas. The arenas are run by The Grandmaster who has a rather tough enforcer named Skurge (Karl Urban) who plays a big part in the plot of the film. While fighting in the arenas Thor runs into the beautiful Valkyrie (Tessa Thompson) a fellow contestant. The two earn each other's respect and plot a way off the planet. Somehow, Skurge turns to the light and helps them escape." The first thing to note is that it sounds like Ragnarok will be the name of a planet in Thor 3. In the comics, Ragnarok was a cyborg clone of Thor that Tony Stark made in the Civil War storyline after the real Thor was missing, presumed dead. This would lead us to believe that may not be the case. It is also worth noting that it appears they have changed the planet from the original Planet Hulk story, which took place on the planet Sakaar. But it was already expected that this movie would be making significant changes to the source material. It is also interesting and very seemingly logical that Skurge will be an aid to Jeff Goldblum's Grandmaster. Again, Grandmaster was not the one pulling the strings in Planet Hulk originally, but he makes total sense given that his character loves games of skill and chance. Plus this would gel with what we have heard about Grandmaster being the one making warriors such as Hulk and Thor fight in the arena games. It also would make sense that they would run into Tessa Thompson's Valkyrie during this part of the movie, given that a bunch of great warriors are made to fight for entertainment in Planet Hulk. No doubt, the most significant detail is that Skurge will have a change of heart and turn to the good guy side of things in Thor: Ragnarok. How that will happen at all remains a massive mystery. Perhaps Thor and Hulk will convince him that Cate Blanchett's Hela is a larger threat and needs to be stopped? Truthfully it is hard to guess without knowing more about the movie. Even though these plot details don't tell us a lot, they should certainly be encouraging to fans. It sounds like Marvel isn't just bringing in new characters just for the hell of it. They really seemed to have legitimate story-driven reasons to bring on the new talent. Granted, Cate Blanchett as Hela, though exciting, still remains a massive mystery in terms of how she factors in. Not to mention that we have absolutely no idea who Sam Neil is playing, who was recently confirmed to have a role in the movie. Thor: Ragnarok is currently being filmed under the direction of Taika Waititi, who directed What We Do in the Shadows as well as Hunt for the Wilderpeople. The movie sees the return of many familiar faces, such as Chris Hemsworth as Thor, Tom Hiddleston as Loki, Anthony Hopkins as Odin and Mark Ruffalo as Bruce Banner/Hulk. Also returning are Tadanobu Asano, Zachary Levi and Ray Stevenson as The Warriors Three. Thor: Ragnarok is set for release on November 3, 2017. Thor: Ragnarok Director Recently Met with Marvel, Was It About Guardians 3?